→The Best Razor E300 Electric Scooter Reviews: Is It For You? Is Razor E300 Electric Scooter For You? While cruising kick scooters are quite convenient means of transportation, they need some kicking action from the riders. This isn’t the case with electric scooters, which are much more convenient and don’t require constant kicking, though we can’t say that the level of engagement into the driving process is less than with kick scooters. If you have been looking for a good electric scooter, you have probably stumbled upon Razor E300. It is an interesting model for a good price, but is it the best electric scooter you could get? Let’s find out on our Razor E300 review! Razor E300 features a super-sized frame and deck that are solid enough to support up to 220lbs of weight. This makes E300 suitable for 12+ years old kids and some of the adults. Unfortunately, Razor doesn’t provide data on the deck’s dimensions in their product description, so it’s difficult to say what shoe sizes it would accommodate. E300 comes with wide 10-inch pneumatic wheels that are capable of ensuring sufficient support and stability during the trips. Additionally, they make E300 ideal for cruising because pneumatic tires absorb shocks quite sell, but you shouldn’t expect car-like comfort because E300 doesn’t have any suspension. As Razor says, E300 is their speediest electric scooter at the moment. After all, it drives at a pretty good speed of 15 mph. While this may sound not nearly good, it is quite sufficient to ensure quick and safe rides to your destinations. Two 12V sealed lead acid rechargeable batteries allow the electric scooter to operate up to 40 minutes. It is quite difficult to say how many miles you could run on one charge as Razor doesn’t provide data on the maximum range of the scooter. We probably can’t calculate the range precisely as we don’t know at what speed the batteries can pull off those 40 minutes. But overall, E300 will most probably be suitable for shorter trips. With rechargeable batteries, you won’t have to think about gas and its cost. On the other hand, you might notice your electricity bills rise slightly up if you use the scooter often. The main downside of E300 is the durability of the batteries. According to a multitude of user reviews, it takes only a couple of months for the batteries to wear out completely. Sure, you could easily push the scooter to reach your destination, but why should you spend time and effort on it when you could have intact batteries? So if you plan to use E300 for a long time, you should think about getting a Razor E300 battery upgrade. Riding Razor E300 is quite convenient. The acceleration is managed through the twist-grip acceleration handle, which allows you to more or less precisely control the speed of the scooter. As for the brake, it also is hand-operated, making braking with E300 much more convenient than with regular kick scooters that mostly come with rear foot-operated brakes. Razor E300 has a retractable kickstand to keep the scooter in an upright position during short stops. Quite a good maximum speed of 15 mph. 40 minutes of use thanks to two rechargeable batteries. The batteries are really low-durability. You will have to take into account the costs of battery upgrades as well if you want to use the scooter for the years to come. The first question to answer is “do I need an electric scooter or a regular kick scooter”? In this regard, there are a number of things to take into account. The main difference between electric and kick scooters is that you don’t need to kick the ground to accelerate with an electric scooter, unlike standard kick scooters. This might make electric scooters more suitable for longer trips, though this will depend on your endurance with kick scooters. On the other hand, riding an electric scooter may be actually more difficult. Because you keep your both legs on the deck, balancing the scooter becomes more complicated yet more important. If something goes wrong, you have less time to react. With kick scooters, one of your legs is constantly engaged in kicking, so it may be easier to react to losing your balance. Electric scooters are made for cruising and never for trick riding. If you want a scooter for scooting around, an electric scooter may be a good choice. Otherwise, if you want a stunt scooter, electric scooters aren’t for you. If you are definitely sure that you need an electric scooter, you need to understand whether or not Razor E300 is a good choice for you. All in all, E300 is suitable for 12+ years old kids and adults whose weight doesn’t exceed 220lbs. You would also need to take into account the deck size and the height of the handlebars, but because Razor doesn’t provide clear data on them, you might need to do some further research to find out whether E300 will be convenient for you or not. The Razor E300 vs. E100: Which Is Best for You? If the Razor E300 specs satisfy you, you should also remember about the low durability of the batteries. You will have to replace them, and the sooner, the better. If you don’t mind to do some more digging to find good batteries and are ready to spend additional money, there should be no reason to not go for Razor E300. You will get Razor E100 Electric Scooter. Each type of scooter has its own specifics, and electric scooters are no exception. Stunt, cruising, electric, and other scooters are designed for different target audiences, and you can’t apply the same guidelines for each of them. Now, we are going to present you with the main features of electric scooters to help you with choosing one. Maybe not the most important characteristic, the maximum speed of an electric scooter may be important for some. Higher speed doesn’t mean better, and you probably shouldn’t pick the fastest available electric scooter due to safety precautions. Remember, electric scooters aren’t designed for racing, they are instead created to help you with safely getting from point A to point B. So pick the speed that you are most comfortable with and that satisfies your needs. We think that the maximum range is much more important than maximum speed. The range of an electric scooter depends on the capacity of the batteries as well as the scooter’s energy consumption at a given speed. Generally, manufacturers indicate the range in their product descriptions, but that isn’t the case with Razor E300, unfortunately. If you know the routes you will be traveling through with your electric scooter, you should be able to pick a scooter with the right range quite easily. The battery time is also somewhat important but not as informative as maximum range. If the manufacturer provides you with a chart of speeds and corresponding battery operation time, you could more or less precisely calculate how long the batteries can actually work at various speeds. However, the manufacturers mostly write vague “40 minutes”, like with Razor E300, but you can’t really tell how many miles you can travel in those 40 minutes. Make sure to do as much digging as possible to find out the intricacies of the battery time we have told you about. Another important feature is the weight capacity of an electric scooter. If you don’t weigh that much, you shouldn’t worry about the weight limit as most of the modern scooters support up to 220lbs. But if that’s not enough for you, you will have to look for something else. Do not neglect the weight limit, though it may seem that a 220lbs scooter can hold heavier individuals pretty well. Excess of weight may and probably will make the scooter break prematurely. Some electric scooters come with 3 wheels while others, like Razor E300, come with 2. This may be more of a personal preference, but 3-wheel scooters are easier to ride than 2-wheel models. Choose one or the other depending on your skills and desires. Wheel size and width impacts the stability and comfort of riding. In general, the wider and the bigger the wheels, the more stable the ride becomes. Electric scooters may allow you to replace the stock wheels with something better, but you should make sure that the frame can take the size of the replacement wheels. Dimensions aren’t about the general size of the scooter: it is more about the width & length of the deck as well as the height & width of the handlebars. The former determines the max shoe size that can be accommodated by the deck while the latter will impact the posture and the width of the grip of the rider. Imagine if you get a scooter with too low handlebars: you would have to ride in a bent position, which is not only inconvenient but also will sooner or later result in back issues. Overly high handlebars also do not do well as they won’t allow you to assume full control of the scooter. Pick something that is ideal for you or those who will be using the scooter. 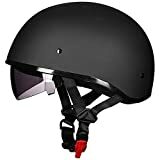 If you will be buying an electric scooter online, you might need to visit a local store to check it out yourself to make sure that the desired model fits you well. As for the deck size, you should go for a model with some free room for your feet. Do not buy a scooter with a deck that only accommodates your feet and has no free space left. In this case, changing posture will become rather inconvenient. Most importantly, picking the right size is not only about convenience but safety as well, so make sure to pick the ideal size for an electric scooter. Apart from the features, do not forget to look into the downsides of electric scooters as well. Some models may come with minor disadvantages while other scooters, like Razor E300, can come with quite sad cons such as low-quality batteries. This is important because you will probably need to replace the faulty or low-quality components, and planning your budget beforehand would be much better. From the standpoint of the budget, there is something else you may need to account for apart from the price of the scooter itself and the cost of the replacement of the faulty parts. Sometimes, scooters come with spot-on components, but you may discover that their specifications aren’t enough for you. For instance, buyers of stunt scooters frequently replace the stock bearings with better units while others who are satisfied with their moderate quality don’t mind sticking to them. This could apply to any component of the scooter. That’s why conducting thorough research is important: you need to know everything about the particular model of an electric scooter to know if there is something to replace. Electric scooters and gas scooters are pretty similar yet very different. They are both designed for the same purpose, that is, transporting you from one place to another. However, electric scooters have some downsides as well as upsides when compared to gas scooters, which we are now going to examine in depth. In some jurisdictions, electric vehicles with up to 500-watt motors do not require driver’s license to be operated on the streets. If you don’t have a driver’s license, an electric scooter would be a great choice. However, make sure to check out your local laws to learn what kind of electric scooters you don’t require a driver’s license for. Electric scooters are much cheaper themselves, though some expensive electric scooters can cost as much as cheap gas scooters. However, the long-run costs are much more important and influential than the initial price, and electric scooters are more affordable from this standpoint as well. Charging batteries cost no money at all in comparison with gas refills, so an electric scooter would be a great choice if you are on a tight budget. Cost-efficiency makes electric scooters preferable for shorter trips. Why pay the money for the gas to just drive a couple of miles? Instead, use much more affordable electric scooters! Scooters can be easily used for exercise. By simply turning the power off, you can drive an electric scooter just like a regular kick scooter. Besides, you could ride your electric scooter like a kick scooter in case you run out of battery charge, which cannot be done with gas scooters. In some regions, electric scooters are treated like bikes and are thus allowed to be driven on bike lanes and parked on bicycle parking spots. However, some jurisdictions somewhat restrict the access of electric scooters to bike lanes. In Canada, for example, an electric scooter needs to have pedals to meet bicycle regulations. So whether or not you will be able to enjoy the advantages of bike lanes and parking spots will depend on your local law. While gas scooters are much cleaner than regular cars, they stand nowhere near electric scooters. And that isn’t that surprising as batteries of electric scooters do not produce any emissions. Using electric scooters will allow you to keep the environment a little bit cleaner as well as avoid taxes related to vehicle emissions. In regard to maximum speed, electric scooters hobble far behind gas scooters. Gas scooters have much more powerful engines, allowing them to reach destinations much quicker. Smaller and lighter electric scooters can’t support too much weight. This won’t be a problem if you are not a very heavy individual, but the weight limits of modern electric scooters might force you to choose a gas scooter instead. Gas scooters can ride for much longer distances than electric scooters. The size of the batteries of electric scooters puts some limits on their maximum range while gas scooter’s gas tanks are less susceptible to such limits, though they have their own restrictions, obviously. Electric scooters won’t be suitable for regular trips often of miles long. While not every gas scooter can support a driver and a passenger, some models have a passenger seat. This isn’t the case with electric scooters, though a few high-end models come with two seats. If you absolutely need a scooter with a passenger seat, it would be much easier and more reasonable to get a good gas scooter with a high weight limit. Hopefully, our Razor E300 review helped you to form the right image of this great model. You could read other Razor E300 electric scooter reviews if you wish to get more diversified opinions to make the right choice, but what we said should be quite enough. 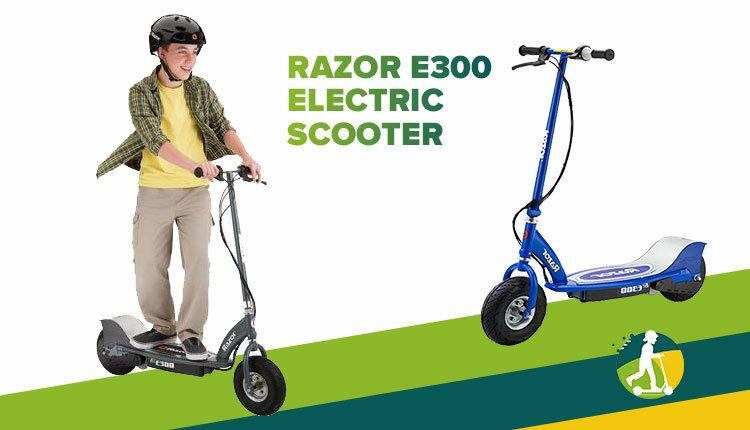 And if you like Razor E300 electric scooter and don’t mind its downsides very much, why not get it?